Combination of style, functionality and convenience. 【VERSION】Wallet case compatible with Apple iPhone 7 & iPhone 8, screen 4.7 inches. Best manufacturing process and precise cutouts of speakers, microphones, cameras, charging port, audio port and buttons. 【LARGE STORAGE CAPACITY】4 card slots for 4+ cards, ID card or drive license; 1 zipped pocket securely for 4+ cards, 8+ cash and coins. 【HIGH QUALITY】100% handcrafted soft leather texture comfortable touching feelings. Durable TPU bumper design protect devices against sudden risks as drops, shocks, scratches. 【DUAL DETACHABLE STRAP】Adjustable shoulder strap length measures 45"-54" with flexible buckles, easy to remove wrist strap and change into handbag. New design handbag perfect for daily, workdays, short trips, outdoor vacations used. 【18 Months-100% SATISFACTION LAMEEKU BRAND GUARANTEE!】LAMEEKU customer team would endeavor to win 100% customer satisfaction.If you meet any question, please contact us, we will fix your issue within 12 hours. 1. How many cards does it hold maximum? can i put cash in it as well? According to our test, the card slots can hold up to 4 cards and the zip compartment can keep 3~7 folded cash plus 3~6 coins. 2. Is there any protection for the screen? The built-in case is made of soft TPU materials to protect your loved phone from drop and shock. And the edge are 1.5 mm higher than the screen so that it can avoid risk from scratch and shock. 3. Do I need to take the case off to charge my phone? The wallet is made of PU leather with good heat dissipation. So that it’s Okay to charge without taking it off. 4. Can people still hear you clearly when talking on the phone with the case on? Rest assured this case is with precise cut-outs to protect camera and ports which allow good signal transmission. You can enjoy phone talking with clear sound. 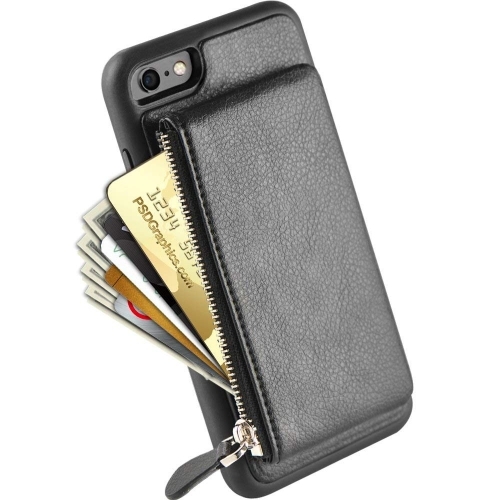 This case is with precise cut out that fits your iPhone well and there’s no extra space for another case. Rest assured there’s a built-in case made of soft TPU materials and the edge are 1.5 mm higher than the screen to protect your loved phone from drop, shock and scratch. iPhone 8 Case Zipper Wallet, iPhone 7 Leather Case with Kickstand, LAMEEKU Shockproof Credit Card Holder Slot cases for iPhone 7/iPhone 8 4.7"